Just a couple of weeks ago the owner of a two family home in Amesbury, Massachusetts saw some “strange equipment inside a common area” of the property. Consequently, she called the police. They quickly obtained a search warrant and notified members of the DEA. 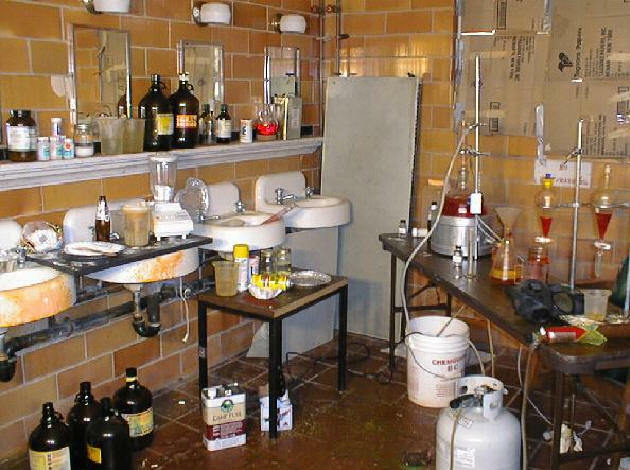 The search warrant was executed and authorities found materials used to manufacture crystal meth and GHB. No suspects have yet been arrested. This post examines what can happen to the suspects when they are arrested, how the prosecution will try to prove its case and some defenses to the potential charges. What Can The Suspects Be Charged With? More likely than not the charges will be manufacturing a class B substance in violation of Massachusetts General Laws Chapter 94C Section 32A. A conviction for this crime carries a possible ten year state prison sentence. Given that there is no indication as to how much of the substance, if any, was manufactured it is unlikely that a trafficking charge will be filed. There is a possibility that a conspiracy charge may be issued against one or all of the accused. Conspiracy charges carry the same potential sentence as the underlying crime, in this case manufacturing of a class B substance. How Will The District Attorney Try To Prove Its Case Where No One Was Home At The Time The Search Warrant Was Executed? Unless of course someone saw the suspects using the strange equipment or bought drugs from them that can be traced to this home the district attorney will have no direct evidence of guilt. Thus, there will be a heavy reliance on circumstantial evidence. Specifically, the prosecution will try to show that the defendants access to the home and connection to the equipment makes them guilty of manufacturing the drugs. I imagine that the equipment will be fingerprinted. Perhaps DNA will link the suspects to the lab. Utility bills might link them to the property. Neighbors and family members will be interviewed and possibly called as witnesses to place the suspects at the home thereby arguably linking them to the drug lab. And of course, you can bet that if the suspects don’t have lawyers at the time of their arrest they will be mercilessly interrogated and one of them might agree to cooperate against the other. As I have mentioned several times in the past, “presence alone in area where contraband is found cannot show requisite knowledge, power, or intention to exercise control over drugs” however, “presence, supplemented by other incriminating evidence” can lead to a conviction. One of the keys here is for the accused not to talk when they get arrested. In cases like this a defendant wants to distance himself from the property. Drug labs are volatile. People don’t live in them. So refraining from admitting a connection to the property will serve you well. The Law Offices of Stephen Neyman, PC has been defending drug cases in Massachusetts will great success for nearly three decades. If you are charged with a drug crime you need a lawyer. Attorney Stephen Neyman can help. Call us now at 617-263-6800 or send us an email. Lets get started with your defense.